In 2014, Catholic Sisters petitioned the Vatican and Pope Francis to endorse an International Day of Prayer and Awareness Against Human Trafficking (IDPA). When Pope Francis agreed, he asked the sisters if they had a day in mind when this worldwide observance should be held. 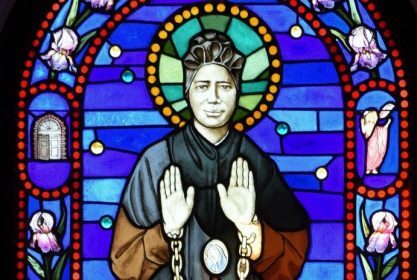 The response was immediate: February 8 – the feast of St. Josephine Bakhita! The International Union of Superiors General (UISG) was charged with promoting this event, and the first IDPA was celebrated on February 8, 2015. This year, we are preparing for the 5th annual observance of the International Day of Prayer and Awareness Against Human Trafficking. In years past, we have used this opportunity to highlight the practice of child trafficking, the connection between human trafficking and migration, and to shine a light on the often hidden crime of human trafficking. Over the years, gathering in prayer has facilitated collaboration and overcoming boundaries with those working on other issues such as human rights, rights of the child, migration, etc. Human trafficking is a great tragedy that requires us to come together and join forces for the common good. We embrace that call with the 2019 prayer theme, “Together Against Human Trafficking”. Click here for the prayer service in English and in Spanish. USCSAHT is the U.S. representative to Talitha Kum, the UISG-sponsored International Network of Consecrated Life Against Trafficking in Persons. We provide our members with direct, easy access to information on the activities of Talitha Kum, including IDPA and much more. Through USCSAHT, our members are connected to Talitha Kum’s 22 other networks in 76 countries, which represent the anti-trafficking work being done by sisters throughout the world. Donations and memberships make their work possible, we encourage you to support their mission to educate, advocate and provide access to survivor support. USCSAHT is a 501(c)3 organization.